The neck region is vulnerable to different kinds of stresses. Bad posture can lead to alignment problems of the neck. Accidents can lead to whiplash injuries. Age can cause arthritis. Even the seemingly simple activities like reading in bed can cause neck pain. While both men and women suffer from neck pain at one time or another, it most commonly occurs in women. Neck pain is categorized as acute or chronic depending on several factors—and regardless of the severity of the neck pain, demands a visit to your Fremont pain management clinic. Acute neck pain: When the onset is sudden due to trauma and it exists for less than three months, it is acute. Acute neck pain may be caused due to injury, muscle strain or facet syndrome, among several other traumatic conditions. Chronic neck pain: Neck pain is considered chronic when it is long-term and has been present for more than three months. Chronic pain can be a result of degeneration, disease or severe injury. This can affect any part of the neck, such as the ligaments, discs, muscles, joints or even the spine. Both acute and chronic neck pain can easily be cured or reduced with appropriate pain management administered by a specialist. The cervical spine (the neck) is one of the most flexible parts of the spine. It is made up of several components, such as seven small vertebrae, seven shock absorbing discs, muscles, nerves as well as vertebral ligaments that hold them in place. The cervical disc at the top connects the spinal column to the skull. The spinal cord is housed in a canal within the cervical vertebrae, and goes down till the end of the spine. The cervical nerves also spread down into the arms, and this is the reason pain in the arms can sometimes be due to a problem in the neck. Cervical spine is an important part of the anatomy as it plays a crucial role in supporting the weight of the head, providing range of motion and protecting the spinal cord. Due to the enormous burden of supporting the skull, the cervical spine is vulnerable to injury and degeneration. All problems related to the neck are taken care of by a trained pain management specialist who understands its anatomy, the disorders and the best possible treatment. Vertebrae: Vertebrae are the bones of the spine and the human vertebral column consists of 33 vertebrae, which include 7 cervical vertebrae, which are part of 23 presacral vertebrae. These 23 vertebrae are responsible for movement and ensure flexibility of the vertebral column. Cervical Vertebrae: The 7 cervical vertebrae or bones (in the neck) are classified as C1, C2, C3, C4, C5, C6 and C7, where C stands for cervical. All these 7 bones are stacked one above the other along the neck and form a continuous column from the neck to the chest. The C1 and C2 vertebrae, which are the topmost vertebrae near the top of the neck, are responsible for the rotational movement. The C1 holds the skull up and is named after the mythological titan Atlas who is said to have lifted and held the Earth on his shoulders. The C2 is called the Axis, as it provides the axis for the skull and Atlas (C1) to rotate when the head is moved from side to side. These two bones not only support the skull, but also help the entire body coordinate and balance. Among the spinal vertebrae, the cervical bones are the thinnest and the most delicate. Yet, they have the tremendous responsibility of supporting the head, protecting the spinal cord and providing movement to the neck and head. These cervical vertebrae have several other important functions critical to our survival. The important nerves and blood vessels that pass through the neck are safeguarded from damage by the bony arches of the cervical bones. Vertebral Discs: The seven cervical vertebrae are separated by vertebral discs that provide a cushion and the ability to absorb impact. There are several problems associated with discs that can lead to acute or chronic pain. o Herniated, ruptured or bulging disc – This is caused due to the discs falling backwards. When this happens, pressure and irritation is felt in all other related structures, such as the spinal cord, tissues, muscles, nerves and ligaments. This may lead to chronic pain. o Degenerative disc disease – When these discs wear out with age and become dehydrated, it leads to degenerative disc disease. As the discs degenerate and become thin, they start compressing the spine and other parts. They may also cause pinched nerves. Degenerative disc disease causes chronic pain that needs pain management and sometimes cervical spine surgery. o Injuries – Injuries to the discs may be caused from accidents or even strain, leading to acute or chronic pain. Nerves: These are spinal nerves from the cervical vertebrae. They branch out from the seven cervical vertebrae of the spinal cord. There are eight cervical nerves, from C1 – C8. The nerves from C1 through C7 branch out from the spine and emerge from the top of each cervical vertebra of the same number, and the C8 nerve branches out from below the C7 vertebra. Each nerve supplies the spine, muscles, skin, upper extremities and every other part of the upper body. They are among the most important in the nervous system. The cervical nerves can branch into multiple parts of the body, and a particular body part can be connected to more than one cervical nerve. Due to their wide distribution, any inflammation or compression of the cervical nerves can cause distress and pain in several parts of the upper body. For example, if there is a problem with the C1 and C2 nerves, pain radiates into the head and face. Any inflammation or compression of the lower cervical spinal nerves, may lead to irritation and pain in the hands, wrists, triceps, biceps and the diaphragm, depending on the affected nerves. Ligaments and Muscles: The neck has many non-moving structures other than the nerves, including ligaments which bind the vertebrae together and enable the spine to withstand heavy loads and stresses, while limiting the range of motion. Most neck pain is related to ligament or muscle problems. The muscles of the neck are responsible for movement of the head and neck. These muscles work in pairs on the left and right sides, and control the flexion and extension of the head and neck in different directions, as well as the rotation of the head. The neck muscles have the best endurance power when compared to other muscles in the body. However, the ligaments and muscles of the neck are prone to problems caused by repetitive movement, overuse, stress or injury. Any damage to them may lead to irritation of the cervical nerves or even result in injury to the nerves. This leads to chronic pain. 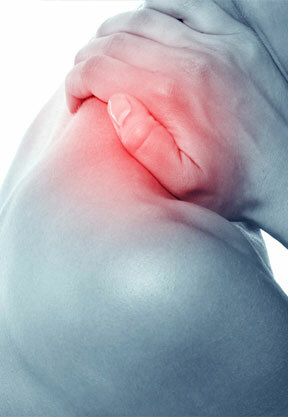 One of the most common problems related to ligaments is ligament tears, which can cause enormous pain. There may also be a simple dysfunction that causes pain. Also known as the cervical spine pain, neck pain causes a lot of discomfort and lends the person almost immobile not only in the head and neck but in the shoulders too. Symptoms of neck pain are obvious and most people can recognize that there is a problem in the neck area. It reveals itself usually as pain in the nape of the neck or sides of the neck radiating above the neck and into the head. Tingling and numbness in the upper extremity can also be related to the neck. Neck pain may be caused due to a variety of causes, ranging from bad posture to serious conditions and injuries. Injuries: Sports-related injuries, falls or car accidents can lead to a sprain in the neck, which is called “whiplash” injury. When the neck is forced to move beyond its normal range of motion, the ligaments, muscles and other soft tissues of the neck are stretched beyond normal, leading to swelling, pain and limited motion. This is usually long-lasting chronic pain. Apart from any medications administered, the following treatments are often adopted. Posture: The spine needs to be stable and in complete balance with the line of gravity. When the muscles of the neck and trunk are weak or when the person maintains a poor posture for, it can lead to muscular fatigue, musculoskeletal imbalances, joint compression etc. This results in tightness of the neck muscles or pain. Poor posture includes hunched shoulders, the habit of looking only in one direction, leaning over frequently, keeping the head forward. The good news is that it is possible to maintain a good posture with practice. Emotional stress: The muscles in the neck and shoulders contract when the person is in emotional distress. Anxiety and depression can lead to a mechanical dysfunction in the cervical spine, especially in patients who are in the habit of tightening or clenching their neck, shoulder, back or arm muscles. All these happen unconsciously and depict the different ways people react when under stress. In cases of an existing neck injury, emotional stress can aggravate the pain or prolong the healing process. Treatment can be therapeutic massage, behavioral therapy, yoga, meditation and other relaxation techniques, biofeedback or trigger point injections. Age-related wear and tear: As a person grows in age, the spine undergoes many changes. Practicing poor posture throughout the life or a lazy lifestyle can cause problems after years of wear and tear. The discs and joints of the neck get stiff and swell, leading to nerve impingement at any level of the spine. This mostly requires conservative measures, good diet and exercise to keep the pain under control. Muscle Strain: This is one of the most common forms of neck pain and is caused by heavy physical activities, repetitive motion or poor posture when working or sleeping. Treatment involves conservative pain management methods. Cervical Spondylosis or Neck Arthritis: This is caused from compression of the cervical nerve root or spinal cord, due to spur formation (spondylosis) and is a degenerative and progressive disease which is treated by a neurosurgeon. The sooner it is treated, the better the result. Cervical spondylosis is caused by degeneration due to age. It is the osteoarthritis of the neck. It can be due to degeneration of the intervertebral discs, decreased cartilage between the vertebral bodies, laxity in the spinal ligaments, and other conditions that cause spur formation, leading to the narrowing of spinal canal. It is most common in people over 40, but an early onset is possible with trauma. This can cause pain, stiffness, muscle spasms as well as “pop and crack” of the neck. Spinal Stenosis: Spinal stenosis (narrowing) is a condition where the spinal canal housing the spinal cord and the nerve roots, is compressed. This causes “pinching” of the spinal cord and/or the nerve roots, leading to pain, weakness, numbness or cramping. It is called cervical spinal stenosis when the narrowing happens in the cervical spinal cord or nerves. This results in cramping, sharp stabbing pain, tingling of the arms and hands or numbness of the neck and head. This pain usually radiates to the arms and shoulders. The narrowing of the spinal canal is generally caused by the compression caused by osteoarthritis. There is no cure for spinal stenosis but there are treatments that reduce pain and improve flexibility. Exercise is a very important part of treatment. Degenerative Disc Disease: This refers to the changes that happen in the spinal discs as part of natural aging, and can also occur from a herniated or torn disc. Degenerative disc disease can occur anywhere in the spine, but it mostly affects the neck and lower back areas. Patients experience severe pain. Treatment is mostly with pain medication, physical therapy, as well as heat or ice application to the area. Cervical Radiculopathy: Cervical radiculopathy, also known as a pinched nerve, is a form of neck pain that leads to severe disability. It results from an inflammation or compression of a cervical nerve root. This happens due to other conditions that place pressure on the nerves, leading to pain that radiates through the arms, causes headaches, numbness, muscle weakness and more. A herniated disc, degenerative disc disease or spinal stenosis can cause cervical radiculopathy. Treatment involves reducing the pressure on the nerves. An anti-inflammatory medication and physical therapy may be administered. Rare Causes of Neck Pain: There are other rare conditions that cause acute or chronic neck pain. Central sensitization is one such condition of the central nervous system, which can lead to pain in different parts of the body, including the neck. Malignancy, cancer of the oral cavities and neck, infection and any spinal cord disorder can lead to neck pain. Diagnosis of the problem usually begins with a neck examination by a pain specialist who manages cervical spinal pain. Cervical Provocation Discography – A poke in the disc! In most cases, it takes about 4-6 weeks to get relief from neck pain. Mostly neck pain is caused by repetitive activities and prolonged movements of the neck. Such pain is usually treated using conservative measures. The doctor suggests a treatment plan based on the level of pain and the etiology. Ice Cold or Hot Packs: Even patients on prescription medications can benefit from ice packs and heating pads. An ice pack placed on the area of pain and pain radiation for about 10 minutes every few hours helps relieve the pain. A heating pad on low or medium heat for about 15 minutes every few hours is helpful. Patients can also buy the single-use heat wraps that work for about 8 hours. Spinal Manipulation: Also called the Osteopathic Manipulative Treatment (OMT), spinal manipulation is non-invasive and combines the power of osteopathic, chiropractic and physical therapies. OMT is used as an alternative, or in conjunction with, medication or even surgery. Manipulation is done using hands with the intention of adjusting the small joints between the bones in the spine. This is done to release pressure in the affected joints, improve blood circulation, restore full movement of the neck as well as restore the elasticity of the muscles and other soft tissues. Depending on the severity, more than one sitting may be required. It is done by osteopaths, chiropractors, and some physiotherapists. Eat Healthy and Get Moving – Doctors prescribe healthy food and exercise as part of a neck pain treatment. Nutritious food strengthens the muscles and bones of the body, including the neck, heals damaged ligaments and tissues and improves functioning. Diet is an essential part of the healing process, as it builds bone and muscle, ensures good bone density and muscle mass. Movement strengthens muscles. Exercise for a few minutes each day. Perform stretching and strengthening exercises to prevent stiffness, and keep the neck flexible and strong. Avoid performing any activities or exercises that cause neck pain. Sitting at the computer for long may aggravate the situation. Physical Therapy – Physical Therapy can work its magic on neck pain, helping increase flexibility, strength, range of motion and offering the ability to resume normal activities. Massage – Massage is therapeutic in nature and is a highly effective treatment option that is usually recommended alongside other treatments, avoiding areas that are painful. Gentle massage encourages blood flow, and relieves stress, stiffness, tension, cramps, and pain. Nonprescription creams or gels like Bengay may also provide relief. Pain Relieving Medications– Pain relieving medication is prescribed for instant relief from neck pain. Acetaminophen (Tylenol) may be prescribed. Non-steroidal anti-inflammatory drugs like Ibuprofen (Advil) and Naproxen (Aleve) may be suggested by the doctor for pain and inflammation. Biofeedback – This is a process where the mind is used to control body functions, such as skin temperature, muscle tension, blood pressure etc. Initially, for patients undergoing biofeedback for the first time, the therapist attaches sensors from a monitoring device to the patient’s body. This provides feedback on a body function. Physical and mental exercises are taught to patients to gain the ability to control the body part, and the results are witnessed instantly on the monitor. When the desired change is achieved, the monitor beeps. Electromyography (EMG) is one method used for performing biofeedback, where the device measures muscle tension while the patient practices some form or relaxation, such as meditation or visualization. Acupuncture – Thismay be the best to ease neck pain. An age-old healing practice from China, in which thin needles are placed at specific points in the body. It works by releasing the “chi” or the vital energy by stimulating the points along the energy pathways. According to scientists, the needles help the body release endorphins, which are natural painkillers. While it is said to work wonders for back pain, it is also being used for neck pain, stress, stiffness, spasms, headaches, tension and limited range of motion. Spinal Cord Stimulation (SCS) – This stimulation takes place in the cervical area of the spine. Small electrodes placed in the epidural space emit a small quantity of electric current to stop pain signal transmission to the brain. When this current is passed by the electrodes, it offers significant pain relief. This method is administered to patients when conservative methods provide no relief. Occipital Nerve Stimulation – Thisis almost like spinal cord stimulation, where electrodes are used to interrupt pain signals. The only difference is that here the electrodes are placed at the back of the head near the Occipital nerves. This reduces pain levels. Occipital Nerve Blocks – Here, a local anesthetic and a steroid are injected over the occipital nerves to block them from sending pain signals to the brain. This results in significant pain relief. Transcutaneous Electrical Nerve Stimulation (TENS) – Thisis yet anotherpain-blocking therapy where low–voltage current for pain relief. When the current is delivered through the electrodes, pain relief is experienced by some patients, as the current stimulates the nerves in the area of pain, which blocks normal pain signals. Cervical Epidural Steroid Injections (CESI) – These are one of the most successful pain management therapies for neck pain, caused by degenerative disc disease, spinal stenosis and cervical radiculopathy. This procedure involves injecting local anesthetics, steroids or other pain medication into the epidural space near the affected nerves. This provides relief from neck pain, but some patients may need multiple injections before they experience relief. Infusion Techniques – They are long-lasting nerve blocks that work by placing a catheter in the epidural space, which continuously supplies medicine and local anesthetic to the affected nerves. This infusion causes significant long-term pain relief to patients suffering from chronic pain. Trigger Point Injections (TPI) – They are used to treat painful muscles that have trigger points or muscle knots that usually form when they are strained. Trigger points may cause irritation of the nerves, causing pain. Twitches, muscle tightness, spasticity and cramps are treated using these injections. Botox Injections – Studies show that Botox injections are not just meant for removing wrinkles, but they hold the potential to reduce chronic neck pain significantly, when used in conjunction with physiotherapy. Botulinum toxin type A (Botox) has the capacity to relax muscles and treat contractions. Regeneration Injections – Regenerative medicine is one of the most exciting forms of treatment for soft tissues. Platelet Rich Plasma (PRP) injections are a non-surgical way of eliminating neck pain or any other joint pain. The patient’s own blood is used and the platelets are concentrated before being injected in the injured area. It is used to treat damaged neck joints and soft tissues. Cervical Medial Branch Blocks (MBB) – Also calleddenervation, this is a minimally invasive therapy, used to treat neck arthritis or cervical spondylosis. It is used to treat any inflammation of the facet joints in the cervical spine. The medial nerve branch supplies these facet joints. An injection of an anesthetic or steroid is given to block pain signals from the medial branch. These nerves are also destroyed using radiofrequency ablation, if the nerve block does not provide relief. Radiofrequency ablation burns the nerves completely and provides long-lasting pain relief. Cervical Lysis of Adhesions – This procedure is performed when there is scar tissue build up in the epidural space and it causes acute pain in the neck. It is administered to patients who have not benefited from conservative measures. It is advised for patients suffering from radiculopathy, disc disease, vertebral body compression fractures and for patients suffering from post-laminectomy syndrome. Whatever the type of treatment the doctor advises for a specific type of neck pain, it is advisable for patients to discuss in detail with the doctor, providing all the information related to the medications they are on, any previous surgeries, other health conditions and allergies to medications. The doctor will choose an appropriate treatment modality based on the patient’s past and current medical history. This in itself dramatically reduces potential risks and complications.